Omara 'Bombino' Moctar, a Tuareg musician from Niger, is a nomad in the widest sense of the word. 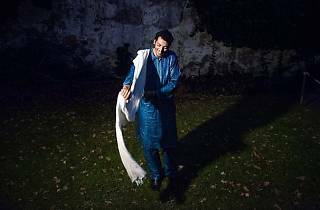 Years ago he circled the globe performing his music, which, with Tuarag roots, is similar to that of Tinariwen and Vieux Farka Touré, who he shares a record label with. Tuareg revolts forced him into exile, and it was on these trips when he learned to play the guitar. His return to Nigeria give him a name in the world of desert blues, and he took the opportunity to put this style on the world map and give Sahara rock a bit of pop sensibility. Bombino's live shows, in a quartet Tuareg musicians on two guitars, bass and drums, are magnetic. Tonight he presents his new album, 'Azel' (2016).